Mobile device use is changing the way consumers shop for vehicles. Shoppers are researching vehicles whenever and wherever they are, and arriving to dealer lots better informed than ever before. To complicate the vehicle sale, consumers are using mobile devices on the dealer lot to simultaneously shop competitive inventory, a practice commonly referred to as showrooming in other retail environments where shoppers can competitively shop and buy online while in a brick and mortar retail outlet. To better understand the impact of mobile adoption for automotive retailers, Cars.com partnered with Placed. 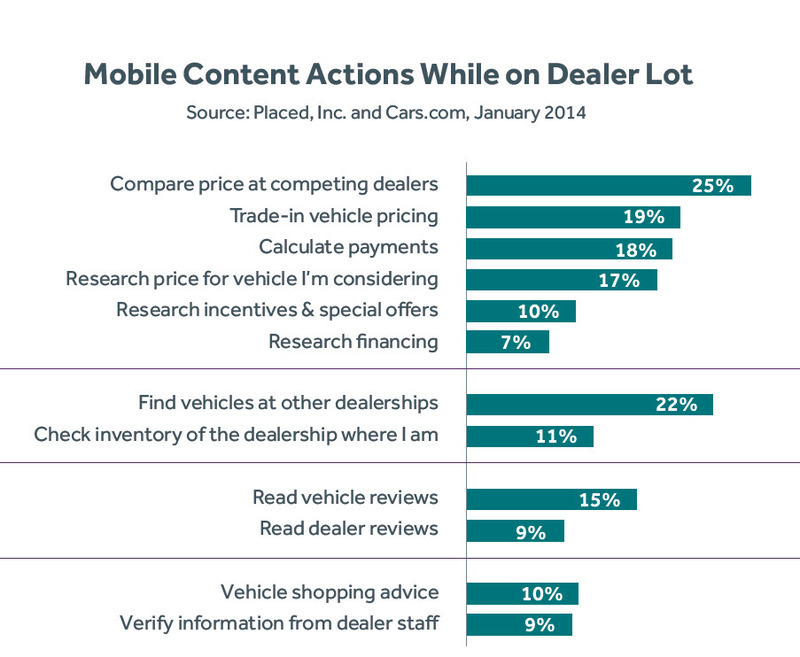 In this independent study commissioned by Cars.com, Placed used its location based panels to survey shoppers who were visiting a dealer lot, and to understand the role mobile devices played leading up to their dealership visit and on the lot. Universal adoption: 81% of auto shoppers used smartphones to do research when purchasing a vehicle, including 63% who used their smartphone while physically at an automotive dealership. Automotive “showrooming”: The study found that mobile auto shoppers were 72% more likely to visit an additional dealership than shoppers who did not use a smartphone. Mobile ad Influence: Advertising played a key role in influencing decisions as 33% of shoppers were lured to a competing dealership based on a mobile advertisement found while on a dealer lot. For more insights from Placed, please visit our resource library.